On Friday’s "Early Show," co-host Julie Chen and reporter Chip Reid analyzed the Values Voters Conference in Washington this weekend and how conservative Evangelicals "are deeply frustrated because they can't find a Republican candidate they can coalesce around," according to Reid. He went on to exclaim that "There's one Republican candidate, though, who really has some Evangelicals dispirited. Rudy Giuliani, because of his support for abortion rights." In order to emphasize the dire circumstances of the Republican Party, Reid continued by discussing how a third party candidate backed by the religious right could, "... allow Clinton to cruise to victory..." and that "Many Evangelicals say forming a third party to oppose Giuliani is a prescription for Republican disaster." BOB SCIEFFER: The headline of this debate last night, Harry, it seems to me, was other candidates now confirm that Hillary Clinton is the front-runner. They know it, she knows it, and they all acted that way. You know, all the little barbs were directed at her but they were very, very polite. HARRY SMITH: Yeah, I mean It was like fish hooks. It was really not -- nobody took out the spear. Nobody took out the heavy weaponry. Everybody said leading up to this, if something's going to happen, these other candidates are going to have to draw blood. It's almost like they never drew their weapons. CHEN: And just how difficult would it be for -- to get everyone on the same page and rally behind one candidate? JULIE CHEN: "This morning in Washington, thousands of Christian conservatives are gathering for a conference that is vital to them and the Republicans running for president. CBS News Capitol Hill Correspondent Chip Reid is inside the Washington Hilton Hotel. Chip, good morning." CHIP REID: "Well good morning, Julie. There are expected to be about 2,500 leading Christian Evangelicals here for this conference this weekend. They are enormously powerful. By some estimates, Christian Evangelicals make up 25% of the electorate. But right now, they are deeply frustrated because they can't find a Republican candidate they can coalesce around, or as one participant put it, they can't find anybody who rings their bell. For decades, Evangelical Christians have been a driving force in the Republican Party, helping propel Ronald Reagan, and later, George W. Bush to the White House. But in this election, no Republican has yet earned the Evangelical seal of approval. 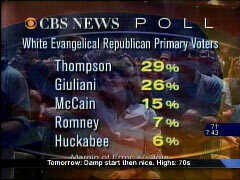 The latest CBS News poll shows just how unsettled Evangelical support is. Fred Thompson leads by a small margin, but there's no clear front-runner." AMY WALTER: "You're looking at a pretty dispirited base of people, pretty disappointed with the current field." REID: "There's one Republican candidate, though, who really has some Evangelicals dispirited. Rudy Giuliani, because of his support for abortion rights. Tony Perkins is the chief organizer of the Values Voters Conference." TONY PERKINS: "We're going to stand our ground. If that means we've got to look for a third-party candidate who's pro-life, then that's what we'll do." REID: "And Perkins is not alone. A number of leading Evangelicals have threatened to abandon the Republican Party if Giuliani is the nominee." RUDY GIULIANI: "I'm not running for religious office." REID: "Giuliani, who leads the Republican field in most national polls, says Evangelicals should support him, because he has the best chance of defeating the leading Democrat, Hillary Clinton." GIULIANI: "I run the most competitive against Hillary Clinton by a big, big margin." REID: "But here's the problem for Giuliani -- if he's the nominee and Evangelicals follow through on their threat to form a third party, that would split the Republican vote. Some analysts predict that would allow Clinton to cruise to victory, much as her husband did in 1992. In his first race for the White House, when third-party candidate Ross Perot split the Republican Party. Many Evangelicals say forming a third party to oppose Giuliani is a prescription for republican disaster." RICHARD CIZIK: "They want to prevent the worst candidate, the alternative, in this case, Hillary Clinton, from being elected. But a third-party candidacy will probably ensure a Clinton back in the White House." REID: "And all the major Republicans will be here today and tomorrow to try to convince this group that he's the one. We'll see, Julie." CHEN: "Yeah, we sure will. Well Chip, what is the group trying to accomplish at this summit?" REID: "What they really want to do more than anything else is find a Republican candidate they can coalesce around, and that has been extraordinarily difficult at this point. Now, I should say there's another goal that many of them have, and that is simply to stop Rudy Giuliani before they figure out who the real candidate's going to be." CHEN: "And just how difficult would it be for -- to get everyone on the same page and rally behind one candidate?" REID: "Extraordinarily difficult. If you talk to people coming to this conference, everybody has a different opinion. Some people say Romney's the one. Some people say McCain, Thompson, Huckabee, all over the map, Julie." CHEN: "We'll stay tuned. Chip Reid. Thanks, Chip."